Hertel Glass and Surfaces gives your windows and mirrors a streak-free shine, while leaving a fresh, clean scent throughout your home. 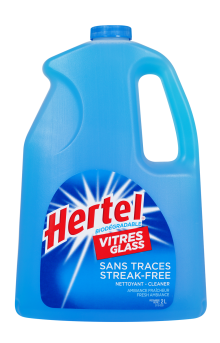 Biodegradable and phosphate-free, Hertel Glass and Surfaces eliminates grease, dust and other dirt on a multitude of surfaces. Throw the windows wide open and let the spring breeze in. Like a breath of fresh air, this ethereal mixture gives you a feeling of well-being and relaxation. Spray the surface and wipe it with a cloth or paper towel. 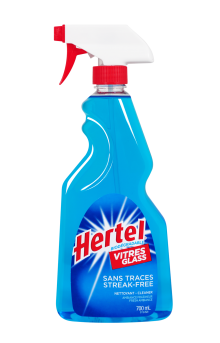 Use Hertel Glass and Surfaces every day to remove fingerprints on cabinets, tables, walls, doors and appliances. Did you know that budget paper towels are better than high-end brands for cleaning windows and mirrors? In fact, the ultra-absorbent and highly durable paper towels often contain resins that can leave streaks on your windows. Lint-free cloths are also great for cleaning windows.